On the Shadow Era Wiki Sustain is defined as a game mechanic that was introduced in Shattered Fates. This mechanic is found on cards that would otherwise be rather powerful for their cost. This effect causes the controller of a card with a Sustain cost to have to pay a cost (health from their hero or shadow energy generally) as the cost for keeping that card on the field. Aside from a cards original casting cost, sustain is an ongoing unpreventable cost that a players HERO must pay at the end of each of your turns. The sustain cost must be paid in full for the card to persist and the cost can not be reduced in any way. At the end of your turn, if the sustain cost can not be paid, the card enforcing the sustain cost will self destruct. If there are more than one card with the same sustain costs, they will be paid at the end of turn in Standard Resolution Order. Shadow Era: Community Classics is a weekly show highlighting some of the most intense and crazy games Shadow Era has to offer! All games featured on the show are submitted by members of the Shadow Era community! This week episode features ETCoggthekiller playing Majiya and BP LightningFury playing Zhanna. Check out more Shadow Era videos at Eric’sCrusade. Elemental class has always had some powerful class cards with weak draw. Antimatter has increased in Shattered Fates, with Bloodthirsty and Dimensional Ripper still running strong for Elementalis. •Elementalis – 3SE: Target friendly ally gains +1 base attack and +3 health. •Zaladar – 4SE: Up to 2 different target opposing heroes or allies take 3 electrical damage. •Piraxix – 4SE: All players discard 3 cards from their decks. 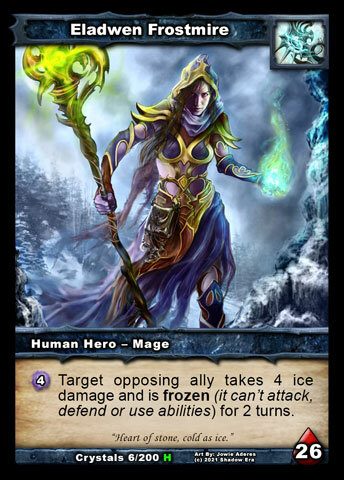 Target opposing hero or ally takes X damage, where X was the number of allies discarded, to a maximum of 4. On Meltdown Monday we attempt to best random opponents in Shadow Era with a 30+ card deck made from the contents of 4 booster packs. This is currently the only sealed format available to digital players of Shadow Era, but is quite popular, and can be quite challenging to learn how to properly assemble your deck. This week follow Alzorath vs ItsMeVan. For more Shadow Era videos check Alzorath’s YouTube channel. What should the Design Team strive for in terms of balance? Do you want each archetype to have the same overall winrate (RPS) or that each archetype has a 50ish winrate against every other archetype (RTS)? The first case is akin to Rock-Paper-Scissors. You could argue that it is a perfectly balanced game since each move has a theoretically equal chance to win – they all have one auto-win and one auto-loss. The outcome of a match is decided solely by your pregame choice. The most successful players will be those that read the metagame better. In Shadow Era terms, that would be like a Rush Eladawen beats Allied Moonstalker beats Solo Gwen beats Rush Eladwen metagame. Follow Alzorath in a series in which he will be post-commentating interesting matches related to a number of decks for a variety of purposes (and maybe even a rare meltdown match) – whether they be for Shadow Era Deck Techs, or for personal exploration into theories and concepts involving trends (or even anti-trends, such as disused card types). Check out more Shadow Era videos at Alzorath’s YouTube channel. GGWP are series that follow some of Shadow Era tournaments commentated by FDL. This time we follow pjoe’s round through the Finals of this 16 men popup. Featured are Ao1 pjoe0211 (Control Eladwen), BP DOXSTA (Raikka), ETC Veles (Ravager Banebow) and BP LightningFury (Discard Zaladar). You can check more Shadow Era videos at Fou DeLile YouTube channel. Hunters have such a wide variety of draw options, including class specific in every category except allies. In earlier expansions, Bazaar was a favorite of Solo-Gwen helping her to dig for stall cards while she went for the throat, and Victor used Tainted Oracle and Treasured Heirloom for burst drawing. SF bring some new toys but all the Hunters love Hunters Gambit. •Victor Heartstriker – 4SE: Target opposing ally is reduced to 1 health. Return the top Hunter card from your graveyard to your hand. •Gwenneth Truesight – 3SE: Target weapon you control gains +2 durability and has +2 attack until the start of your next turn. 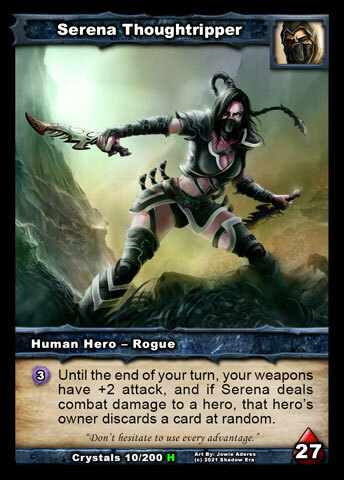 •Ythan Redthorn – 4SE: Target friendly ally can attack 2 times this turn, and has +1 attack and ambush until the end of the turn. This deck is result of an effort to find alternative ways of playing Bloodfang. In QM and tournaments he has been mostly used as pure ally based Wulven deck with pretty straightforward strategy of swarming the board thanks to his ability and synergy between Wulven tribe allies. 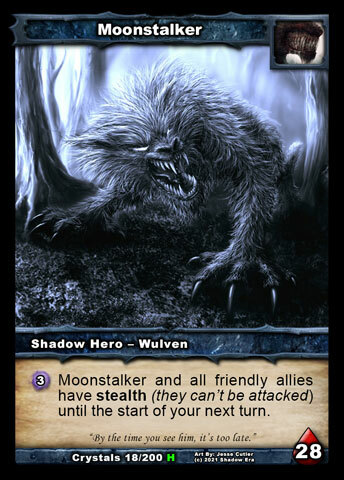 However if you draw a parallel between his and Baduruu’s ability you can see that in its nature Bloodfangs ability is also a tempo boost as it can save up to 8 resources per turn (Howlfang + 3cc ally for example). This lead to me believing it is also possible to make a Bloodfang deck that would mimic Baduruu’s Resource Destruction. As I think I will switch to another hero, I decide to post my Serena deck. This deck brought me to maximum 335 rating (before droping rapidly due to a lot of DC) and gave me 13 win streak(including some MS and ravager). New cutlass is so fun I often use my opponent’s cards to win my game.